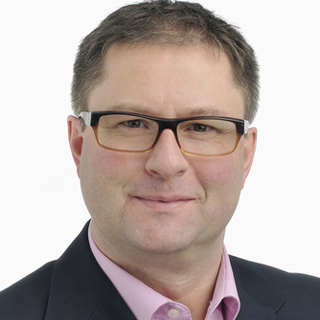 Ludger Fischer, Managing Director, AC Serendip Ltd., Germany. High shear homogenizing and low pressure homogenizing open new pathways for fine emulsions with narrow drop size distributions. Their flexibility allows the introduction of exactly desired and validated shear forces. Typical devices for emulsification in industrial practice are, for instance, simple agitating, rotor-stator homogenizing or high pressure homogenizing. Following is an overview on two state-of-the art emulsification technologies, combined with hands-on experience from pharmaceutical and cosmetic applications. Among others, the examples will comprise a novel rotor-stator system which allows the independent control of shear forces and pumping power. This approach enables the pharmaceutical manufacturer to go beyond the “speed limit” typically imposed by cavitation effects in conventional rotor-stator systems plus several additional advantages. The distinction between so called low-shear and high-shear characteristics no longer exists. In practice high-shear homogenization with rotor-stator systems means powder wetting and dispersion to achieve finely dispersed emulsions with smaller droplet sizes and thus a higher stability and better bioavailability. Also the penetration into the skin is improved with decreasing droplet diameters of the dispersed phase. In standard rotor-stator homogenizers the parameters of pumping and shear energy introduction are coupled, i.e., with increasing tip speed of the rotor, the shear rate and pumping capacity both increase accordingly. 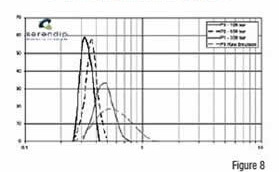 The new High-Shear Homogenizer (HSH) separates the pumping capacity from the shear energy introduction in two different stages (Figure 1). function of pump and rotor speed. The separation of pumping capacity and shear energy introduction, by installing a pump stage in front of the rotor-stator stage has several advantages compared to standard rotor-stator homogenizers. By pumping the product towards the rotor-stator stage, cavitation is prevented by creating a back pressure on the suction side of the rotor-stator and thus enabling tip-speeds far beyond the standard 30m/s up to 60m/s [Figure 2]. Figure 3 shows the pressure development in front of the rotor-stator stage depending on the speed of the rotor and pump. 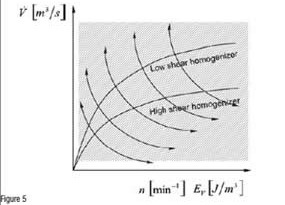 homogenizing shear rate Figure 4 shows some dispersion results of a model emulsion which was homogenized with the HSH at different shear rates. 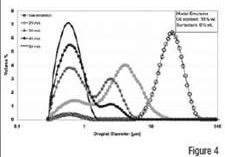 It can be seen how the droplets of the dispersed phase of the raw emulsion with droplet diameters of about 20µm were reduced in size to about 0.6µm at 50m/s. Only 50m/s allows a monomodal droplet size distribution which results in a longer shelf life. On the other hand it is possible to pump shear-sensitive products without noteworthy introduction of shear energy by bypassing the rotor-stator stage. This can be important for the discharge of shear-sensitive gels or for the recirculation of the product via an external heat exchanger for faster cooling or heating. energy introduction. Full flexibility of the HSH The induction of powders or liquids by means of the vessel vacuum is done between the pumping stage and the rotor-stator stage for immediate powder dispersion. The pump feeds the rotor-stator with a steady liquid flow, while the vacuum at the induction valve pulls in the powder or liquid. The controlled flow conditions prevent a break through of the powder in the opposite direction through the pumping impeller. This makes sure that all the powder is well dispersed and wetted and no powder lumps float on the liquid surface of the vessel or in the worst case on the inner surface of the vessel lid or in the vacuum pump. 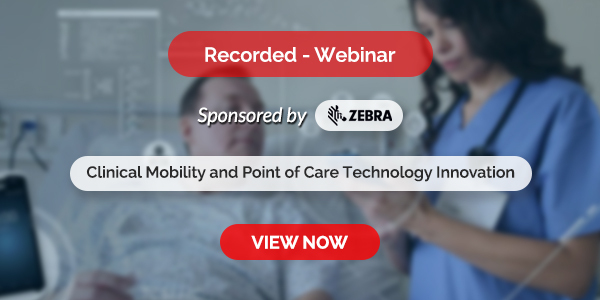 However, the most important advantage of the HSH is its flexibility. By being able to choose independently the flow rate and shear rate it is possible to work in every operating condition. This enables the simulation of every standard rotor-stator homogenizer that is available in the market today (Figure 5). The ability to copy the homogenization step of other homogenizers makes it possible to produce products with the HSH that have been made or piloted before on other systems without revalidating the homogenization step. 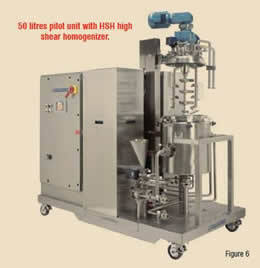 with HSH high shear homogenizer Figure 6 shows a 50 litre HSH pilot unit that is available for testing. Figure 7 shows details of the HSH. Another advantage of the HSH is the easy access to the pump-stage and rotor-stator stage. Just by removing a few tri-clamps the rotor-stator or pumping impeller can be accessed; e.g. for inspection purposes. Removing another tri-clamp allows access to the mechanical sealing level. Another innovative approach is the “low pressure homogenization”. 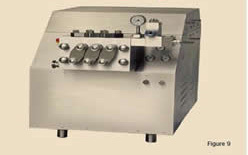 High pressure homogenization systems have been around for over 100 years. In these systems shear forces, elongation, turbulence and cavitation realise the break-up of the droplets through a sudden pressure drop of several hundred bars. A typical set up of a high-pressure homogenizer consists of a premix container for the raw emulsion, a high-pressure pump, usually a piston pump, a pressure measurement device and a dispersing unit. Typically high pressure dispersing units are based on valve systems, sometimes also on nozzle devices. Both technologies have their pros and cons: while the valve systems are versatile due to their adjustability, they generally are not as efficient as nozzle systems. 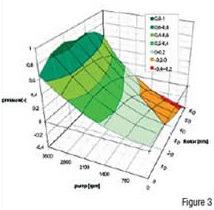 Figure 7: Blow-up of a section of high shear homogenizer The “low pressure homogenization” technology (LPH) combines the advantages of a valve system and a nozzle system yielding extremely fine emulsions at very low pressures and gentle process conditions. Lower homogenization pressure means less stress on the active ingredients that are formulated in the dispersed phase of the raw emulsion. Also the heat development is much smaller, as every 100 bar of homogenizing pressure results in an increase of the temperature of the emulsion by about 3°C. a function of pump and rotor speed. In Figure 8 results of a homogenization trial with the LPH are depicted. The “raw emulsion” had been manufactured by the HSH, with a mean droplet size of 600nm. It can be seen that the droplet diameters of the emulsion could be further reduced to about 300nm in a single pass. In many trials it could be proven that the LPH technology is able to disperse smaller droplet sizes with lower pressure than any other system. Figure-9: LPH-500 Low Pressure Homogenizer LPH technology opens the door to high-quality nano and micro emulsions with their superior properties such as penetration of the natural barrier of the skin, a higher solubility and drug load. Also the shelf life is extended, as with decreasing droplet diameter the stability of the emulsion increases. Other aspects are the sensory properties of the emulsion that change with decreasing droplet size. These properties can vary from a different optical aspect such as shining or transparency of the emulsion to different touch and feel of the emulsion during the application on the skin. 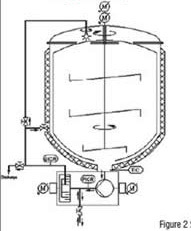 Figure 9 shows a picture of an LPH-500 low pressure homogenizer with a production capacity of 500L/h. 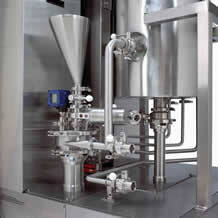 The low pressure homogenizer technology also has the advantage of an easy and safe scale-up. Both systems extend the former limits of those systems with respect to achievable droplet diameters as well as flexibility.